Guillermo Del Toro and Chuck Hogan’s The Strain has been far from a hidden gem. It has appeared as a novel, comic and TV series form. For any horror fan, familiar with the series or not, The Strain series of vampires are reason enough in itself; no sunglasses and sparkles, These vampires are red eyed, wraithlike creatures that feed and eviscerate with a proboscis bursting through their mouths. These vampires stalk the shadows, feeding on human prey and infecting them with parasitic worms, infecting them with vampirism, which places them under the control of “The Master”. As with any great vampire story, those who hunt these creatures are as mysterious and dangerous as their prey. 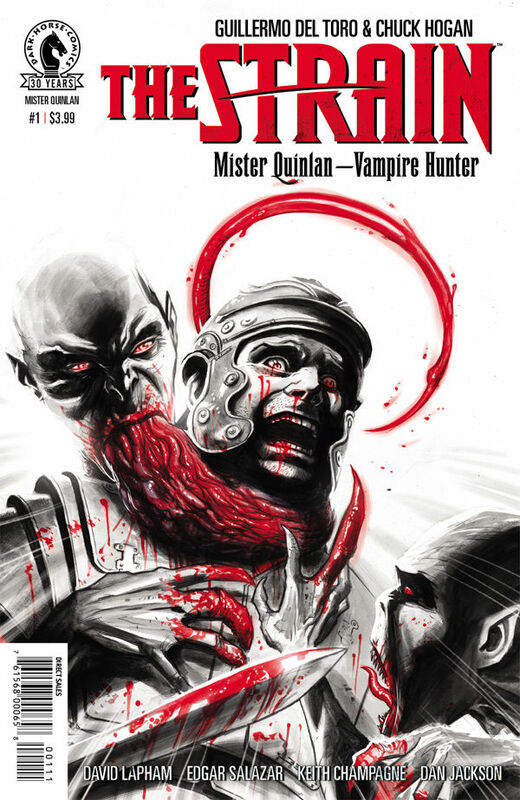 Dark Horse, having brought the original The Strain Comic book adaptation, now return with The Strain: Mister Quinlan – Vampire Hunter. An origin story of a character steeped in mystery. Quinlan is half human, half vampire. He seeks to destroy his own maker, a powerful ancient vampire, know as The Master. 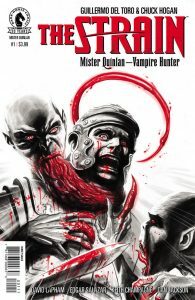 From his twisted conception, tragic and brief childhood, to brutal gladiatorial training in ancient Rome, Mister Quinlan’s origins are full of the action and sheer bloody horror you would expect.